Yesterday, my colleague Paul Dixon brought you the that Apple had added a completely new laptop to its lineup, the MacBook. Not Air, not Pro just the MacBook. In many ways the laptop resembled the iPhone and iPad line more than a Mac. However, it has some new technology that is a bit controversial, including a single USB Type-C port for all functions including video and even power. Why did Apple do this? Let’s take a look and I’ll tell you. The new MacBook is Apple’s first fanless design. This is made possible by using Intel’s insanely low voltage Broadwell CPU under the Core M banner. While the new MacBook Air and 13-inch MacBook Pros also include Broadwell variants, there is a huge difference in power consumption. The 13″ MacBook Pro (you didn’t see the 15″ because the quad-core Broadwell chips aren’t available) uses Broadwell CPUs with the Iris 6100 integrated graphics, which use 28w of power. The lower voltage chips in the MacBook Air, which feature Iris 6000 graphics, use 15w of typical power. The Broadwell chips use an entire 4.5w, typical and 6w in turbo boost. This is much closer to the 2-4w used by smartphone processors than it is to what’s used in what were previously considered ultra-thin laptops. At the same time it should offer something approaching the performance of the Haswell CPUs in the 2014 MacBook Pros. Its not the fastest horse, but its remarkable for how fast it actually is since it’s straddling the line between mobile and laptop CPUs. The original MacBook Air had a single USB 2.0 port and this MacBook returns to that philosophy. The difference is that USB Type-C is much, much more versatile. Think of it as kind of an all-star team of connector features. The Type-C, or at least Apple’s implementation of it, uses fast USB 3.1 for transfer, can deliver enough power for the MacBook’s 29w power supply, and also can delivery DisplayPort/HDMI/VGA signals up to 1080 full HD. Furthermore, it’s tiny, about the same size as Micro-USB and Apple’s own Lightning. Also like Lightning, it’s fully reversible. If Apple and the rest of the industry fully commits to type-C, you could see this begin to phase out desktop USB, Micro-USB on Android/Windows phones and tablets, and even displace Lightning on Apple’s own devices. This could be incredibly good for the market with accessory makers able to design a single device to work on iDevices, Android devices, and computers over the next few years. It’ll also allow Windows hybrid tablets that are much thinner while retaining full capability. There will be a transition period where adapters are present, but USB type-C seems to be a situation where everyone wins. That said, since they are electrically compatible, low-cost micro/mini/full-size type-A to USB-C cables should be possible. The one thing Type-C won’t fully replace is Thunderbolt. Thunderbolt is faster, gives direct access to the PCI-E bus, and can deliver video at a much higher resolution than Type-C. So think of the relationship between the two as a high end-mainstream mix. Because of the smaller size, you’re not going to see much of an increase in battery life. 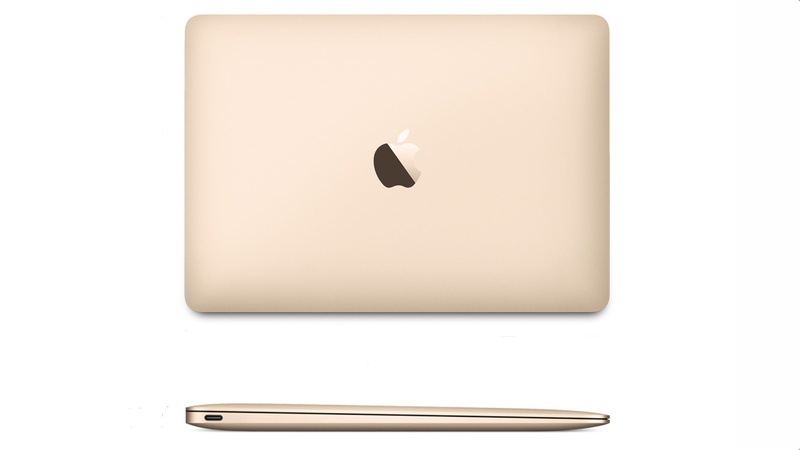 The MacBook has about the same life as the 11″ MacBook Air. If you were hoping for more because the of the power-sipping processor, you’ll be slightly disappointed. The thinner display also leads to a thinner camera part that is 480 standard resolution. Compared to PC Ultra Ultra thin PC laptops, its also missing a touchscreen, but Apple has made it very clear they see a hard line between PCs and mobile devices. The new MacBook is a lot like the Retina MacBook Pro was back at WWDC 2012. It’s a bit of a publicly available prototype of sorts. USB-C is not ready and the first adopters are going suffer a bit for that, especially if you have to pay another $80 just to hook up a hard drive. That’s why the Air is still around despite the MacBook being its obvious long term replacement. The ecosystem and CPUs are going to take a year or two for that to be able to to fully happen. Yet, if they didn’t release it now, adoption of Type-C might be slowed. If you can deal with that, you can buy it right now. If not, there are still 11/13″ MacBook Airs and 13″ MacBook Pros that can fill that need. Make no mistake, in the next 3-5 years, this MacBook is where laptops are going. The world just isn’t completely ready for it yet. I’m a little surprised at this comment, ” At the same time it should offer something approaching the performance of the Haswell CPUs in the 2014 MacBook Pros. Can you back this up with links? I find this very hard to believe. I think usb-c is the future but using only one port is very odd to say the least. In my opinion, it seems Apple has become more about style and fashion and dropped the functional. Can you say gold laptop. You didn’t mention the wonky keyboard that has also stirred up people. I’m disappointed in this laptop and the price (again not mentioned) seems on the high end for these components. I guess time will tell. Here, for one: Other benchmarks are similar. http://www.pcper.com/reviews/Processors/Intel-Core-M-5Y70-Review-and-Performance-Testing-Broadwell-Y/Testing-Setup-and-Si. its about 80% the speed of 4th generation Core CPUs. For a completely fanless SoC design, that’s remarkable.